Norby Williamson - ESPN Press Room U.S.
During his more than three decades of work at ESPN, Norby Williamson has been involved in multiple aspects of the content and business areas of the company, with stints in programming, production and news among the many areas he has touched. 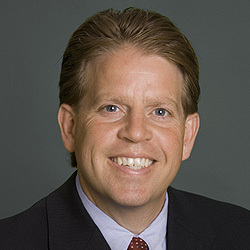 Williamson, who joined ESPN in 1985 as a production assistant in the studio department and quickly rose through the ranks, is executive vice president and executive editor, studio production, overseeing all of ESPN’s daily opinion, talk and news and information studio shows including SportsCenter. Williamson also leads ESPN Audio, the ESPN Talent Office and oversees multimedia sponsorship integration. He was named to his current position in September of 2017. He previously was executive vice president, production, responsible for production operations, remote operations, stats and information, creative and studio direction, ESPN International production and ESPN Deportes production. He has managed ESPN Audio since May, 2015. Williamson served as executive vice president, production, program scheduling and development beginning in January, 2014. In that role, he split responsibilities between management of the many production areas and oversight of programming functions such as all rights negotiations, managing relationships with rights holders and the scheduling of ESPN’s networks. Prior to that, Williamson served as executive vice president, programming & acquisitions from January 2012, overseeing all rights negotiations and managing relationships with rights holders for all ESPN entities. These included ESPN, ESPN2, ESPNU, ESPNEWS, ESPN Classic, ESPN on ABC, ESPN International, ESPN Deportes, ESPN Audio, ESPN.com, ESPN3, ESPN Mobile Properties, new media platforms and more. He was executive vice president, production, from 2007. In that role, he was responsible for all ESPN and ABC game, event and studio production work for domestic and international television and radio networks. Prior to that (2005-07), he served as executive vice president, studio and remote production, overseeing all domestic productions. After two years as a production assistant, Williamson served as an associate producer (1987-89), highlights supervisor (1989), producer (1990-93), coordinating producer (1993-94), senior coordinating producer for SportsCenter (1998-99), assistant managing editor and news director (1999-2000) and vice president and assistant managing editor (2000-02), responsible for SportsCenter, ESPNEWS, Baseball Tonight, on-site studio coverage of golf special events and the network’s studio highlights operation. Prior to assuming management responsibilities in 1999, Williamson’s production work on select ESPN studio programs received a total of five awards, including Sports Emmy Awards for SportsCenter (1990) and NFL GameDay (1988) and three CableACE Awards for SportsCenter (1990, ’91) and NFL GameDay (1989). From September 2002 until October 2005, Williamson served as senior vice president and managing editor at ESPN, responsible for the day-to-day content of all news and information programming on ESPN, ESPN2 and ESPNEWS. He provided leadership and editorial direction for the largest television sports news-gathering operation in the U.S.
On the remote production side, he was responsible for major programming initiatives such as Monday Night Football, NASCAR, NBA, Major League Baseball, college basketball, including the Women’s NCAA Tournament, and college football, including the BCS. He also oversaw studio production, which includes SportsCenter editions in the U.S. and around the world, Outside the Lines, Sunday NFL Countdown, College GameDay, Baseball Tonight, NFL PrimeTime, Monday Night Countdown, NFL Live, NBA Nation and NBA Shootaround. He was also responsible for the networks’ on-site coverage of major events, such as the Super Bowl, NBA Finals, World Series, MLB All-Star Game, Stanley Cup Finals, Men’s and Women’s Final Four, golf’s four major championships, BCS national championship, the Indianapolis 500, Triple Crown and championship boxing. In December 2008, Williamson added oversight for ESPN Regional Television’s (ERT) production responsibilities. Williamson earned his bachelor’s degree in corporate/video communications from Southern Connecticut State University in 1985.